We know that not everybody welcomes Winter. But what other time of the year can you go for windy walks with flasks of hot drinks, wear woolly bobble-hats and come home to a toasty change of clothes that are waiting nice and warm on the radiator? Yeah, maybe people who don’t like Winter just aren’t doing it right! Now that mild September and October are almost out of the way (albeit with the odd storm along the way to keep us on our toes!) it’s time to get serious about the chilly days ahead. 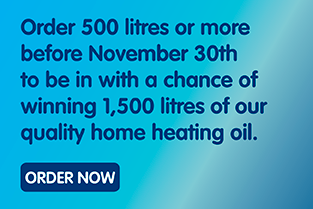 That’s where we come in – because when it comes to quality home-heating oil, we’re top of the class! To mark the end of summer, we’re giving away a special prize to one of our lucky customers. 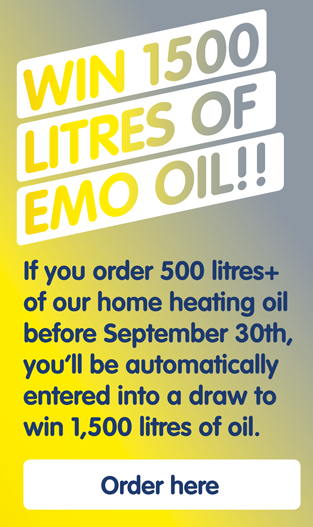 Order 500 litres or more from Emo before November 30th and you’ll you’ll automatically be entered into a draw for 1,500 litres of our high-quality oil. That’ll keep one of you nice and warm well through the next few months!